An in-depth knowledge of Traditional Ecological Knowledge, including wilderness survival, wildlife tracking, edible & medicinal plants, naturalist skills, and outdoor leadership. Skilled professional with a unique background in environmental education, biology, and business management. Over twenty years of teaching and administrative experience at wilderness schools. Confident presenter, able to convey information with clarity and enthusiasm. Innovative, highly-organized, efficient, and resourceful, with an excellent work ethic. Assisting land owners in complying with federal, state, county, and local environmental regulations through the preparation of critical/sensitive areas studies and permit acquisition, communicating effectively with government agencies, private engineers, attorneys, developers, and land managers. Conducting wildlife studies, biological assessments, and preparing data for environmental impact statements (EIS), specializing in endangered/threatened species issues. Performing wetland reconnaissance and delineation, feasibility studies, mitigation planning, restoration design, habitat monitoring, site analysis, and habitat management plans as part of wetland codes and regulations. Using computer-aided mapping and technical report writing to articulate project results and goals for land planners and government regulators. Founded, developed, coordinated, and taught the Wilderness Awareness Residential Program (now called the Anake Outdoor School), an in-depth naturalist educator course for adults that created highly trained graduates, interns, and employees, significantly increasing the organization's sustainability, and enabling the expansion of youth programs. Created a comprehensive curriculum on wilderness survival, animal tracking, bird language, nature-based mentoring, and edible & medicinal plants. Recruited, trained, and supervised a team of three program instructors, ten contract employees, and many volunteers, working together to accomplish program goals. Succeeded in creating an undergraduate credit option for the program through building a partnership with Western State College and becoming federally authorized to accept overseas students, both of which helped boost program enrollment. Successfully registered the program as a state licensed vocational program with the State of Washington, which enabled students to obtain SLM student loans and use other financial aid such as VA benefits. Consistently increased program enrollment from 10 during the first year of operation, to 15, 20, 25, and eventually reaching an annual enrollment of over 30 students. Developed a database of curricular activities that brought greater efficiency to program planning and improved the quality of course contents. Created second year coursework, that included developing and teaching a tracking apprenticeship, which provided excellent additional training for students. Taught additional educational programs for adults and children including summer camps, homeschool and public school programs, adult expeditions, Kamana Naturalist Training Program instruction, and family programs. Helped construct two eco-friendly buildings that provided much needed classroom space. Participated on a voluntary committee focused on improving the quality of youth programs for students and parents through efforts such as enhanced record-keeping of student progress, improved lesson planning, and a parent reader. Executed a thorough marketing plan which included designing an interactive website, creating brochures and magazine advertisements, speaking engagements, a promotional video, and an innovative sponsor network that effectively increased enrollment. Successfully managed a budget of over $200,000, consistently finding ways to increase quality while containing costs. Coordinated several carnivore monitoring research projects that provided important data for wildlife management decisions, including specialized research on mountain lions. Implemented animal tracking methods that increased accuracy, efficiency, and effectiveness of traditional radio-telemetry and motion-sensing camera technology. Accomplished at working in severe weather while traveling through difficult terrain. Created technical reports that clearly communicated project results. Trained and supervised over 20 volunteer college students in data collection protocol. An 800-hour nature study course rated at 38 continuing education credits. CyberTracker Conservation International: Certified as a Senior Tracker (Track & Sign Specialist and Trailing Specialist). Evaluated by renowned tracker/author/evaluators: Mark Elbroch, Brian McConnell, and Adriaan Louw. 2011, 2016. ﻿Discovery Channel's Dual Survival: Consulted behind-the-scenes as a local wilderness expert for the "Coastal Catastrophe" episode of the Discovery Channel's Dual Survival television program (Season 5, Episode 9). Given a brief cameo at the end of the episode. 2014. Common Ground Tracking: Co-founded a wildlife consulting service which specialized in the application of tracking to aid in conservation efforts. Completed an elk survey for the Middle Green River Coalition and a cougar investigation for the Seattle Highlands Community Association. 2004. Bass and Nature Camp: Worked for Grammy-award winning bass player, Victor Wooten, as an assistant instructor at his Bass and Nature Camp for adults. Taught survival, awareness, and bird language to a diverse audience of over 150 professional musicians. Nashville, TN. May 2003. Children of the Earth Foundation (COTEF): Worked as part of a team of instructors that initiated summer camp programs for youth at Tom Brown's Tracker School. Assisted with staff training and curriculum development. Asbury, NJ. Summer 1999. Peter Roberts Productions: Worked with internationally-recognized producer, Peter Roberts, as a tracker and assistant cameraman on the making of Mountain, a film about the wildlife of Mt. Rainier that has aired nationally and internationally, including the Discovery Channel, Animal Planet, and the BBC. Used tracking and trailing skills to locate elk, black bear, mountain goat, and other wildlife for filming. August 1998. Wetland Training Institute: Completed a week-long course on wetland delineation, covering wetland hydrology, soils, and hydrophytic vegetation. September, 2005. Paul Rezendes: Attended Rezendes' sign tracking class. Portland, OR. July 2003. Jon Young: Personally mentored by Wilderness Awareness School's founder, which included one-on-one instruction and traveling around the country assisting at his workshops. 1997-1999. Jim Halfpenny: Attended Halfpenny's gaits and track patterns class. Rexburg, ID. September 1997. 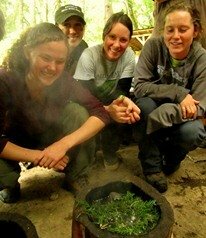 Catkin Moon Medicine Society: Participated in a year-long ethnobotany apprenticeship with expert herbalist, Heidi Bohan. Studied and used local edible, medicinal, and utilitarian plants. 1998. Earth Skills Correspondence Course: Piloted an early version of Hawk Circle's survival skills home study course. Practiced advanced fire-making and shelter-building skills. Spring 1999. Rabbitstick Rendezvous & Winter Count: Attended international primitive skills symposiums. 1997 & 2001. Tom Brown's Tracker School: Completed the Standard Class, Advanced Standard, Advanced Tracking, Philosophy I, Advanced Awareness, and Way of the Coyote. 1997-1999. Wilderness Awareness School: Participated as student and staff at the Tracking Club, Monday Night Series, Art of Mentoring levels I-III, Pine Barrens Tracking Expedition, and Bird Language Week-long Programs. 1997-1999. The American Red Cross: Completed Wilderness/River-Oriented First Aid. 2000. Re-certified in 2007 & 2012. Volunteer Service: Participated in native plant salvage / restoration projects with the Washington Department of Natural Resources (DNR) and worked as a wildlife caretaker for the Progressive Animal Welfare Society (PAWS). Co-authored the research paper: Documenting Presence of Mammal Species in Remnant Wildlife Habitat Using Motion-sensing Cameras and Tracking Methods. Spencer, R.D., P.D. Houghtaling and J.R. Knight. WA Dept. of Fish and Wildlife. 2002. Contributed photos to the field guide: Wildlife of the Pacific Northwest: Tracking and Identifying Mammals, Birds, Reptiles, Amphibians, and Invertebrates. Moskowitz, David. Timber Press. 2010. Contributed significant fieldwork to the book: Tracks & Sign of Reptiles & Amphibians: A Guide to North American Species. Tkaczyk, Filip. Stackpole Books. 2015.